A wasp sting can be rather painful in some cases and the painful sensations usually get accompanied by swelling. 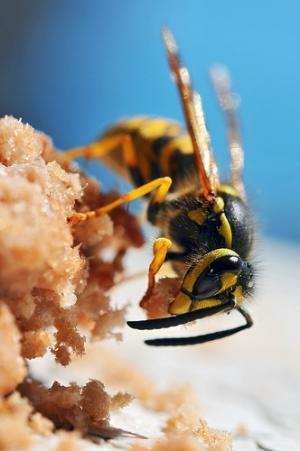 Wasps have double wings and they also have stingers which they use for the injection of venom. Wasps inject the venom through their stingers only when their nest gets disturbed or if they feel threatened in any other way. The most common symptoms of a wasp sting usually include painful sensations, redness, swelling and itching at the affect sting site. In most cases the pain can be relieved using several different methods and the local reaction can also be treated by using different types of remedies. Some people may suffer severe anaphylactic or allergic reactions and those situations require immediate medical attention. Allergic reactions associated with wasp stings can be recognized by numerous different symptoms like anxiety, loss of consciousness, disorientation, light-headedness, difficulty in breathing, itching, nausea, puffy eyelids and lips and vomiting. Different people may react differently to a wasp sting and there are numerous factors involved in that. The severity of pain and swelling largely depends on the number of stings and the location of the sting. It is not impossible to be attacked by a group of wasps because they live in colonies. It is recommended to avoid wasp nests in order to prevent multiple stings from occurring. The first thing that needs to be done after a wasp sting is to pull out and get rid of the stinger. If multiple stinging occurs, the wasp usually loses the stinger, and it needs to be removed as soon as possible. One should use a flat object to pull it out from the skin without breaking it in the process. Once, the stinger gets removed the affected area needs to be washed with warm water and an antiseptic soap. After it has been cleaned thoroughly, the area needs to be wiped with a soft towel. Swelling is usually associated with wasp stings so it is a very good idea to apply an ice pack to the affected area in order to reduce the swelling. One can use one of the numerous antihistamines and antibiotics for the treatment of wasp stings. Painkillers also might come in handy for those who cannot stand the pain. Insect sting relief pads can also be helpful. Scratching the affected areas should be avoided because it may spread the poison further. Itching can be reduced by using Calamine lotion. Home remedies for wasp stings include baking soda, aloe vera gel, apple cider vinegar, lemon, onion and different types of meat tenderizers. What are your injection Site reactions with Copaxone for MS?